This £600,000 project designed by Stoke-on-Trent City Council was administered by Hulme Upright through a Design & Build contract for Seddon Construction Ltd. The development comprised the construction of a new entrance, reception, meeting rooms, staff room, community room and head-mistresses office which has a total floor area of 160m.sq. 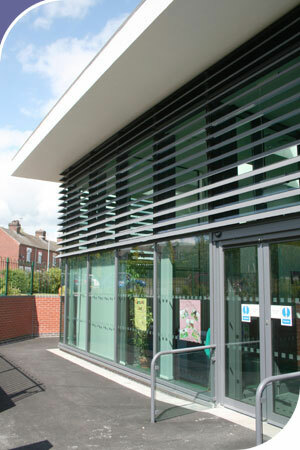 The new entrance and initial reception rooms were design to maximise the usage of natural light and to contrast/compliment the existing school building. On the first floor, a new class room was provided comprising a total floor area of 90m.sq. which sits on top of an existing class room clad in cedar boarding.